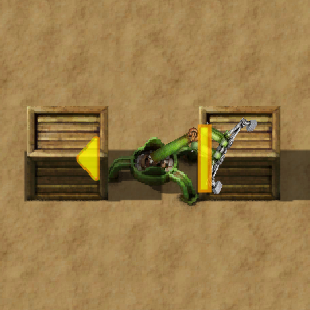 The stack inserter is an electric inserter that can move multiple items at the same time. Moving at the speed of the Fast inserter, it transfers multiple items per cycle to give it a material flow advantage at the cost of additional power consumption. When transferring between chests or cargo wagons it picks up and drops off the entire stack of items instantly. When picking up from or dropping off items onto a transport belt a stack inserter needs to grab or drop each item individually, increasing the time between arm swings and lowering its potential throughput. In these cases, however, the stack inserter still has higher throughput than a fast inserter because it swings back and forth less often. A fully upgraded stack inserter will move up to 12 items per 52 ticks, or 13.85 items per second, from chest to express belt. With the maximal throughput of an express belt at 45 items/second this means that three inserters will almost saturate a single express belt. The stack size is increased by the Inserter capacity bonus (research) technology. The stack size can be overridden to set how many items it picks up at one time, with the maximum being the highest research level currently unlocked. Added stack inserter override feature. Updated stack inserter tech icon. Now unlocked by their own research.